Italian physician; flourished in the sixteenth century. His name seems to indicate that he was a native of Vitry, France, but Gross ("Gallia Judaica," p. 197) thinks that "Vitry" here stands for "Vittoria" in Italy. In 1530 he lived at Sienna, in 1552-63 in Castro. 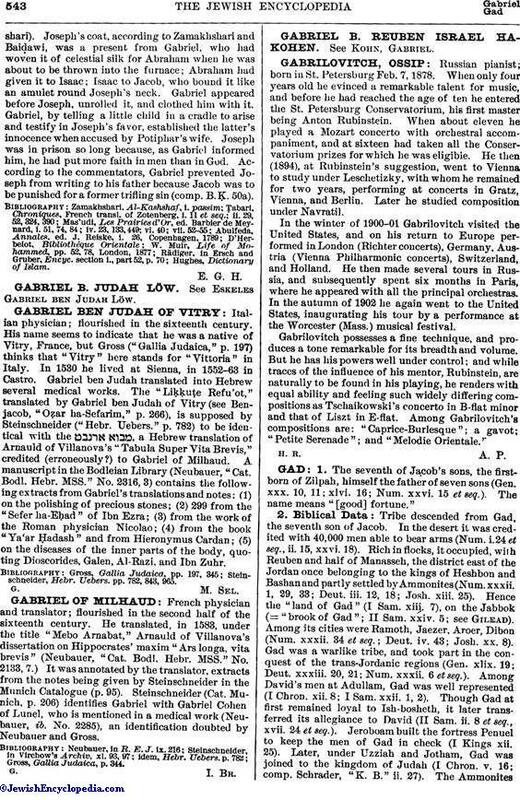 Gabriel ben Judah translated into Hebrew several medical works. The "Liḳḳuṭe Refu'ot," translated by Gabriel ben Judah of Vitry (see Benjacob, "Oẓar ha-Sefarim," p. 266), is supposed by Steinschneider ("Hebr. Uebers." p. 782) to be identical with the , a Hebrew translation of Arnauld of Villanova's "Tabula Super Vita Brevis," credited (erroneously?) to Gabriel of Milhaud. A manuscript in the Bodleian Library (Neubauer, "Cat. Bodl. Hebr. MSS." No. 2316, 3) contains the following extracts from Gabriel's translations and notes: (1) on the polishing of precious stones; (2) 299 from the "Sefer ha-Eḥad" of Ibn Ezra; (3) from the work of the Roman physician Nicolao; (4) from the book "Ya'ar Ḥadash" and from Hieronymus Cardan; (5) on the diseases of the inner parts of the body, quoting Dioscorides, Galen, Al-Razi, and Ibn Zuhr. Steinschneider, Hebr. Uebers. pp. 782, 843, 965.